I. McDonald & E. Kerins Mon. Not. R. Astron. Soc. 477, L21–L24 (2018). In the era of new discoveries with ESA’s Gaia observatory, two researchers have turned to the data archives of its predecessor, Hipparcos, to look for evidence of exoplanets in data taken before the planets’ initial detections. 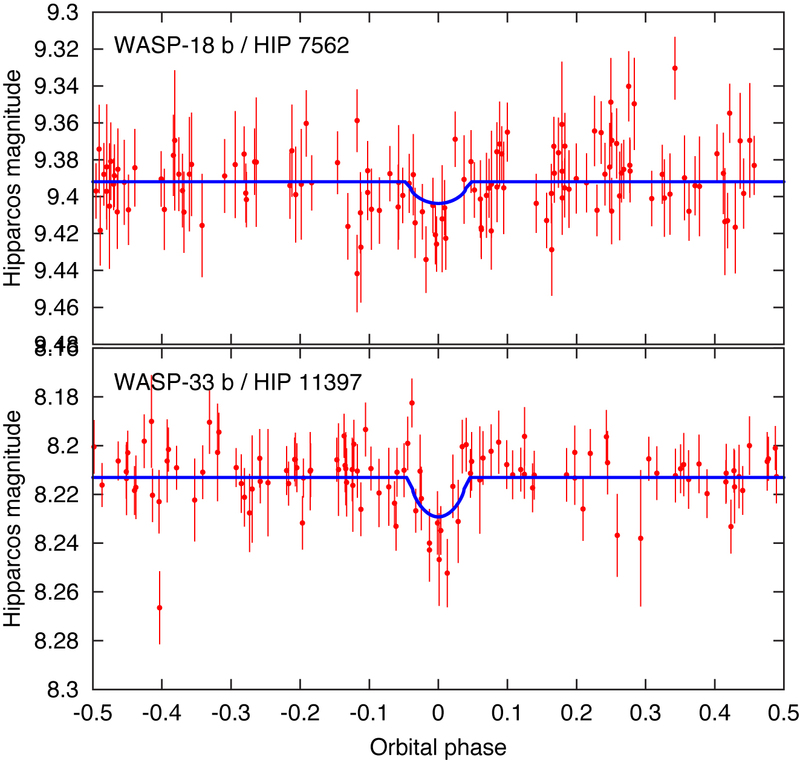 Iain McDonald and Eamonn Kerins recovered transits of WASP-18b and WASP-33b, as well as marginal detections of HAT-P-56b and HAT-P-2b, from lightcurves taken 16 years before the existence of these planets was reported in the astronomical literature. Such an endeavour is not just an exercise in data reduction: extending lightcurve measurements by ~20 years can provide more precise orbital properties for the planets and constrain the tidal effects of the host stars. The Hipparcos satellite is one of the few historical observatories that had the sensitivity and cadence to detect exoplanets, returning broadband photometry at millimagnitude-level accuracy for ~120,000 nearby stars. In the cases of WASP-18b and 33b, the photometric measurements were very sparse: 132 points over 1190 d and 113 points over 930 d (see Figure). Transit detection would have been unlikely at the time of the observations, even had someone been looking (note that an exoplanet around a normal star was first reported some years after Hipparcos had completed its mission). Compiling the Hipparcos data with more modern measurements to give a ~23yr timeline, McDonald & Kerins were able to determine the periods of WASP-18b and 33b to an accuracy of <10-6 d, an incremental improvement. They see some scatter in their fits despite this accuracy, hinting at either unmodelled instrumental effects or the presence of a third body in these systems. Reproduced from Figure 1 of McDonald & Kerins (2018). Credit: OUP.